Long time readers of this blog may have gathered that I am a bit of a fan of novels which include well known literary figures. 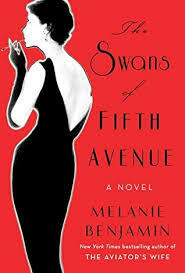 The Swans of Fifth Avenue deals with the friendship between Truman Capote and society icon, Babe Paley. Set primarily in the 1950s and 1960s the novel tells the story of the close friendship between Truman and Babe. The book is filled with the glitz and glamour of life for the wealthy at that time. Champagne is flowing and shopping for fine clothes is what these women live for. Fascinated by the beautiful Babe and the other wealthy women (the swans), Truman soon attaches himself to the group, gossiping with them and playing the part of friend and confidante. This novel posits that Truman's friendship with Babe was more sincere than that he shared with the other women. Perhaps one of the most enjoyable facets of the story is the inner struggle of Babe; a woman who was born and raised to be a beautiful object on the arm of a man, but who longs for something more meaningful. For a time, at least according to the book, Babe's friendship with Truman provided this. But as the years wear on Truman's life takes a turn, his previous successes all but history as he struggles with alcoholism. The writer ends up committing the worst betrayal possible; using the secrets he has learned from the swans in his own work. The book is quite full on at times, and deliberately over the top as Truman Capote was wont to be. While the story may feel melodramatic to some, I felt it captured that particular place and time very well and found it to be an enjoyable story if a little hollow. I think the whole point of the story is that society and money were never enough to make Truman, Babe, or indeed, the swans truly happy and the moments during which the characters' vulnerabilities are most evident are the most rewarding of the novel. For example, the night Truman removes Babe's makeup is quite touching. Perhaps not a novel to change your life, but one which was fun to read nevertheless. Many thanks to the publishers and Netgalley for providing me with a copy.